Lucky Squirrel – Let's Paint Nature! It’s a beautiful hawk!!! I took this picture right out of my dirty window. He sat on top of that swing set for a really long time, just looking left, looking right, up, down, and turned his head all the way backwards to look behind him. No doubt he was looking for breakfast, or was he? In this picture you are witnessing a very lucky squirrel. I thought for sure I was going to see a pursuit, but nothing! Not only that, but two more squirrels walked under the hawk completely unaware that their predator was right above them! 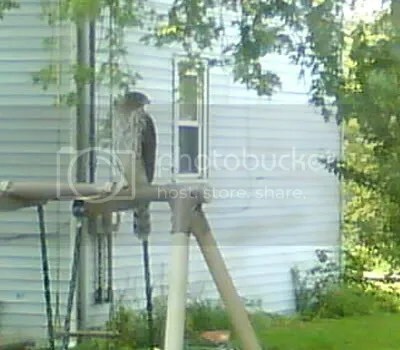 The hawk just sat there and watched them! Maybe Mr. Hawk just had breakfast or could it be that the hawk sensed me in the window and was cautious about making his move? Anyway, the hawk flew off and left some very lucky squirrels. I’m guessing he was a Cooper’s Hawk. Common year round to the Chicago area and willing to visit neighborhood feeders for food. He did have a rounded tipped tail with black bands. He was beautiful! How cool to see this! 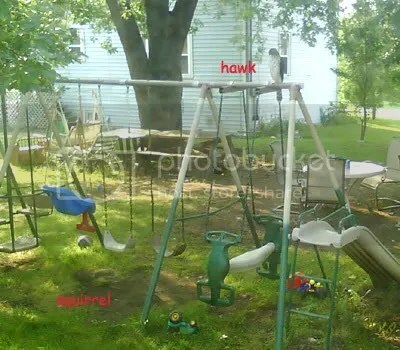 Maybe the Hawk wanted to take a swing on the swing set! LOL! I’m insanely jealous. Around here the hawks are usually after something (typically doves.) The few times I do see them, I’m so in awe I totally forget that my camera’s in my hand until its too late. Drat, I say! As for the “lucky” squirrels, perhaps the hawk might have to be pretty darned hungry before it’ll mess with something that has opposable thumbs. In a simliar vein, I once watched a black racer snake slither right through a large group of various birds (+ 1 rabbit,) feeding on the ground w/o batting an eye. Guess it just wasn’t hungry. The birds didn’t even budge, either. Lana: I too am in awe when I finally get to see a hawk…I love them! Squirrel thumb theory is pretty smart, I would have never thought of it! I actually like when there’s peace in the animal world, too bad it doesn’t last! Wow! That’s one scary looking bird. I had no idea how BIG they are! I always see photos of them in the wild, but when you see one in a community setting like this, you can really see how imposing they are.